Cameras are a great way to collect photos to help add data to OpenStreetMap. To save you the expense of buying one to try it out, we have a 360 degree handheld camera and a dashcam camera available to rent. To benefit from this deal you must be an OSM UK member and, due to postage limitations, live in the UK, Isle of Man, or Channel Islands. A handheld camera with a lens on each side – the LG 360 camera captures images of the full scene around you whilst you walk (example image). It’s a great way to capture a detailed scene with lots of features, such as urban environments or a hiking route where lots of paths converge. Rental is 5 weeks for £11.10. The charge consists of delivery and return delivery (£6.90) and fee (£4.20) that goes towards covering the cost of this scheme. A monopole and memory card are included with the camera; all you need is a smartphone. To upload your photos to a service such as Mapillary (for later use in OpenStreetMap) you will need a computer. This camera is for handheld use only. No mounting to vehicles. To protect the camera, do not use it during rain/precipitation, in temperatures below 0°C or above 35°C, or during high wind. Instructions (PDF; ODT) are included to guide you through the process. Waylens Horizon camera, courtesy of Telenav. An image from Jez driving down Brighton seafront. 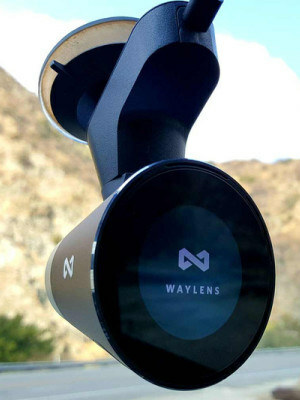 This camera attaches to your car windscreen to capture images of the road ahead. The built in GPS adds location data, and the camera pauses when you stop at a red light. Telenav have specially adapted this camera to automatically upload images to OpenStreetCam when it is connected to Wi-Fi. Rental is 5 weeks for £27 which includes tracked delivery, return delivery, and a small fee to support this scheme and the work of OSM UK. Everything you need is included in the box..except Wi-Fi (the faster the upload speed the better) and a vehicle to mount it to! 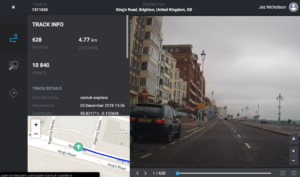 Photos are uploaded to OpenStreetCam under the osmuk-waylens username. Tap Status. The camera will scan for networks. To arrange a rental, review the calendar below for a suitable period and contact rob@osmuk.org with the date and your OSM UK membership details (name and address). Once confirmed you will be directed to the payment site. For Members use only. For OSM activities only. The cost of return delivery is included in the rental fee. On receipt please check that you have all the parts (as per the itemised list in the box / on the instructions). In the event of loss or damage we request that you contribute a minimum of £50 with more on a voluntary basis. Late returns will incur a fee of £6, increasing by an additional £6 per week (they also cause an inconvenience for the next hirer). 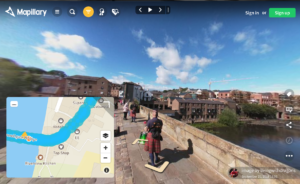 As a non-profit we are delighted to be supporting OpenStreetMap in the UK. We’re aiming high so help is always welcome. To make it easier to discuss ideas and to suggest projects (and vote on them) we have set up a new Loomio group. Here are the latest threads from Loomio. Jump in and let us know your thoughts. Hardware Rental uptake and examples?